Eurocode 7 notes that, for anchored or strutted flexible walls, the magnitude and distribution of earth pressures, internal structural forces, and bending moments depend to a great extent on the stiffness of the structure, the stiffness and strength of the ground, and the state of stress in the ground. This statement emphasizes the importance given by Eurocode 7 Part 2 to performing sufficient and reliable ground investigations (see Chapter 4). Soil-structure interaction analysis is normally performed using a sub-grade reaction model (discussed in Section 12.5.1) or a more advanced numerical method (see Section 12.5.2). In both cases, the analysis depends not only on strength parameters for the soil and structure, but also on suitable evaluation of the stiffness of the structure and the ground in which it is constructed. Sub-grade reaction theory idealizes the soil as a series of linear-elastic/perfectly-plastic springs, as shown in Figure 12.12. The forces on the wall and in any props or anchors supporting it are calculated from deformations along the wall. Iteration brings forces into equilibrium while keeping movements compatible with the elastic properties of the wall. 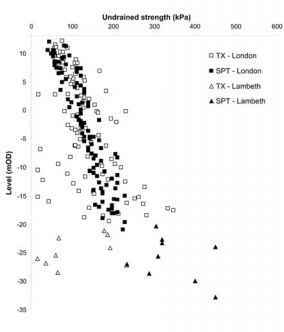 The springs' sub-grade reaction coefficients k are estimated from field and laboratory measurements of soil stiffness (when available), otherwise from crude rules-of-thumb. 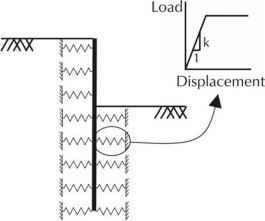 The springs' load capacities are normally defined using limiting earth pressure coefficients (Ka for tension, Kp for compression - see Section 12.4.4). To verify that an ultimate limit state is not exceeded, Eurocode 7 requires partial factors to be applied to actions, material properties, and resistances. Their values depend on which Design Approach is adopted (as discussed in Chapter 6). No partial factors are given in Eurocode 7 for stiffness and hence the design value of the springs' sub-grade reaction coefficients should be identical to their characteristic values. However, CIRIA C58031 recommends that spring stiffnesses for ultimate limit state calculations should be taken as 50% of their serviceability values (to account for the soil's greater compressibility at large strain). This can be achieved by dividing sub-grade reaction coefficients k by a model factor yRd = 2.0. The application of partial factors to soil strength changes the values of the active and passive earth pressure coefficients used to define the ultimate resistance of the soil springs. As a consequence, the interaction between the ground and the structure will differ from that under serviceability loads, particularly if some of the springs reach their load capacity prematurely. The displacements obtained from ultimate limit state calculations using subgrade reaction models should be ignored, since they do not represent the true behaviour of the structure. It is not clear how partial factors can be applied to actions or resistance when sub-grade models are employed. The logic necessary to determine whether a particular component of earth pressure should be treated as a favourable action, an unfavourable action, or a resistance is extremely complicated — even if there were a universally agreed interpretation of the Eurocode. If part of the ground starts to unload, would that signal a switch from one interpretation of earth pressure to another? Unless the computer program has been specially written to include the relevant factors at the appropriate points in the calculation, then the only way to achieve their intended effect is to adjust input parameters instead. This could be attempted by increasing weight densities by 1.35 to simulate the application of yg. However, this is generally not a wise thing to do, since it may lead to unintended side-effects in other parts of the calculation.